Derek McInnes made one change with Stevie May replacing the injured Scott McKenna in what looked a very positive line up. 3,500 members of the Red Army were in attendance at Dens on perfect day for football. The Dons forced a corner in the second minute which May took but it was too long for the red shirts. Immediately at the other end Paul McGowan made a good little burst into the area but Michael Devlin did very well to make a block. Michael was outstanding all afternoon. Then May almost released Niall McGinn on the left but the winger just ran the ball of play. But second later McGinn was fed the ball again and got a good deep cross in for Ferguson to attack at the back post but Dundee eventually got out of danger when Mackay-Steven’s through pass went out of play. McGinn was seeing plenty of the ball in the early stages out on the left which was encouraging. In the 10th minute Madiamga got himself away from Shinnie on the half way line and then in a central position somehow managed to work an opening and his shot did not got far over Lewis’ bar. McGinn then crossed for May and his flick won corner number six. Again it was worked short so McGinn had a better angle to cross, he found Considine who did well to direct a header towards goal but the ball just went wide of Jack Hamilton’s post. For all their dominance it was Dundee who had the best chance of the opening period when a move involving Shinnie and McGinn broke down. The ball was cut back from the right to Sofien Moussa who blasted a glorious chance over. The home side then forced a couple of corners before Ferguson picked up the first yellow card of the game. Aberdeen were now not getting it all their own way. Back came the Dons – McGinn had a couple of runs but his final ball could not create anything. Aberdeen then enjoyed some possession but still not openings. It was needing a bit of quality from someone. In the 65th minute it almost came from Bruce Anderson. A Shinnie shot spiralled up into the air and the Dundee defence, who had looked solid, showed some hesitation for the first time. Bruce Anderson pounced on the mistake and cracked a thunderous shot off the bar. He was so unlucky no to be the hero for the second week in a row. He impetus though help turn the game in Aberdeen’s favour. In the 73rd minute Gleeson was replaced by Forrester. 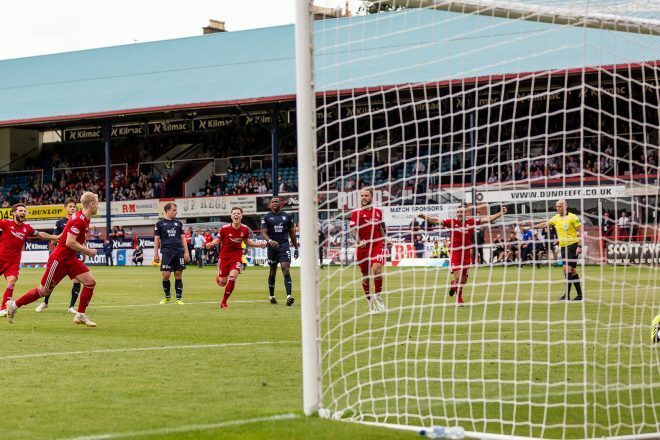 Within seconds of the change Aberdeen had a penalty after a corner finally proved Dundee’s downfall. A deep ball was met by Dominic Ball at the back of the six yard box. Dom, who had a fine game at right back, had got up well and in their attempt to recover the situation Kusunga was adjudged to have handled the ball when his arm was in the air. When ref Bobby Madden pointed to the spot the appeals from the Dundee players were half hearted – they knew it was a penalty. Gary Mackay-Steven kept his cool, sent Hamilton the wrong way and the rolled the ball into the net. Relief of the Red Army.